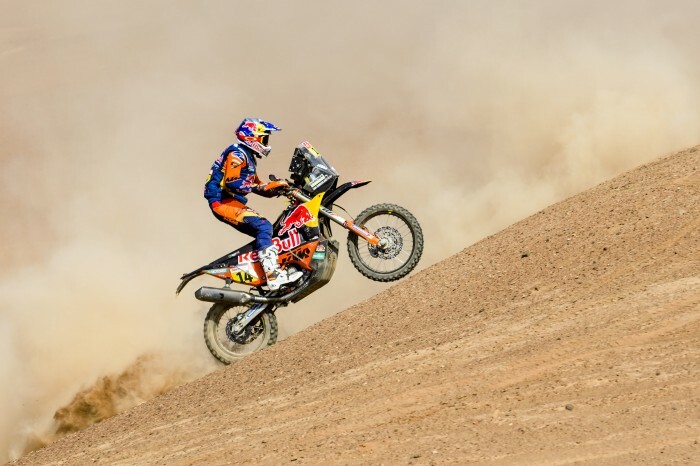 Britain’s Sam Sunderland grabbed second place on the overall Dakar 2019 leaderboard with a stage five win even after stopping to help crasher Paulo Gonçalves. Starting in the first group, Sunderland got off to a solid start, opting not to push straight away and risk a mistake or incident with a fellow competitor. Coming across Goncalves, Sunderland stopped and assisted the Honda man who had broken his hand until the medical team arrived, setting off again after 10 minutes. Pushing hard to make up time the sand specialist demonstrated the skill he is known for, almost catching the front group before the finish. With the time lost awarded back to him, the Brit had done enough to win the stage and move up to second in the provisional overall standings. “Obviously the first thing is to wish Goncalves the best after his accident – it’s always scary when you see that happen in front of you. I stayed with him for over 10 minutes but it’s difficult to gauge how long you’re actually stopped for,” said Sunderland. “A lot of riders passed us and so when I got going again, I just pushed as hard as I could. It’s so difficult when you are behind like that, to know if you are gaining on the guys in front or losing ground.